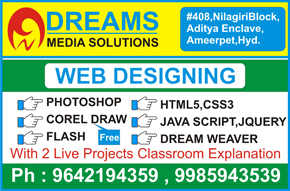 Dreams Media Solutions offers real-time and placement focused Web Designing Course in Ameerpet Hyderabad. Our Web Designing course includes basic to advanced level training. We have designed our Web Designing course content and syllabus based on students requirement to achieve everyone's career goal. After learning both designing and coding concepts we will train you how to develop rich looking web site (Live Project) in Dreamweaver by using DIV's. After that we will train how to host it towards the server side. Hi, my name is Nageswara Rao Gottipati. I am senior trainer in Dreams Media Solutions.I have always had a passion to share knowledge with students.I Have nine years experience in Web Designing and Development.I have formula how to built beautiful websites.At the end of the course you can develop your won websites by using div's. By 2017, Web Designing Industry will grow up to $869 million. This growth will lead to an increase in the number of jobs and high demand for well trained web designers. You can be one of these in-demand professionals. Learn how to design creative web sites from industry experts.Dreams Media Solutions warmly welcomes you to learn web Designing course. In Web Designing course i will train you all these following concepts with real time examples. Web Designing Course Fee: 4000 Rs.